Large swathes of Norfolk, including six villages, could be flooded under a controversial plan to deal with the effects of climate change. The proposal would see Britain effectively admit defeat in the battle to maintain coastal defences and around 16,000 acres (25 square miles) of land in the Norfolk Broads would be allowed to flood. Six villages, hundreds of homes and thousands of acres of farmland would be wiped out over the next 20 to 50 years under the plan put forward by environmental group Natural England. Villagers who face losing their homes have described it as “devastating” and “horrifying”. The area is also one of England’s favourite holiday spots. Experts doubt that coastal defences in the area will stand up to rising sea levels caused by global warming and the plan to “realign the coast” is seen as a less expensive long term option. The sea would be allowed to breach 15 miles of the north Norfolk coast between Eccles-on-Sea and Winterton and would flood low-lying land to create a new bay. 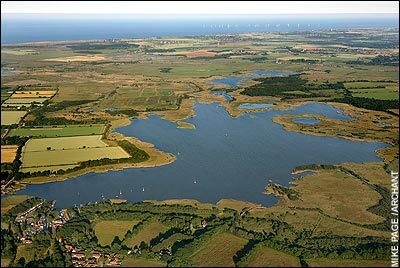 Seawater would destroy the villages of Eccles, Sea Palling, Waxham, Horsey, Hickling and Potter Heigham along with five fresh water lakes. Two new “retreated” sea walls would be erected further back from the original coast line. According to the Natural England report 1.2 per cent of Norfolk would be flooded and the area would revert to saltmarsh to create a new habitat for wildlife. Opponents say the plan would involve relocating hundreds of people from their homes and compensating them. In the short term property would be unsellable. The move would also see a millennium of history vanish under the sea. The village of Hickling is typical of what would be lost. It is mentioned in the Domesday Book under the name Hikelinga and a priory was founded there in 1185. The village has been flooded many times before including in 1287 when 180 people lost their lives. Potter Heigham has similar historical value with a medieval bridge dating from 1385 and a church with a round tower dating from the 12th century. A number of its other buildings are listed by English Heritage. The flooding proposal was discussed at a meeting in Norwich between Natural England, the Environment Agency, the Broads Authority and Norfolk County Council. No final decision has been made. He said one eighth of the area thought of as The Broads would be lost, including Hickling Broad, the largest and most popular. Even if the plan didn’t go ahead for years the effect on the value of properties would be devastating, he said. Steve Hayman, project manager for the Environment Agency, said his organisation was committed to “hold the line” by maintaining existing sea defences for the next 50 years. A Natural England spokeswoman said the “surrender” option was one of many and their report was intended to start a debate about facing up to climate change. She said: “We have got to face up to the issue. We have got to have discussion. There are difficult decisions to be made and we have produced this report after lengthy research. The Broads span 74,000 acres to the north and east of Norwich and are based around 63 shallow lakes, most of which were dug in medieval times by people gathering peat for fuel. The largest is the 350-acre Hickling Broad which one of Britain’s most popular holiday and boating areas and contains a wealth of wildlife. Coastal home owners have won a landmark ruling against a Government agency which was attempting to force them to abandon their homes to the sea. Charlie England, an artist who lives on an eroding cliff at Easton Bavents, north of Southwold, in Suffolk, has won an appeal against Natural England which refused to allow him to maintain sea defences protecting his property. An inspector decided that Natural England’s plans to force erosion on the occupiers of properties on the cliff would have constituted an unnecessary and disproportionate interference with their human rights. Hilary Benn, the Environment Secretary, has accepted the inspector’s report and directed Natural England, his conservation advisers, to give residents consent to maintain the soft sea defences in front of their homes. The ruling is expected to have wide implications for landowners who seek to reinforce sea defences themselves. 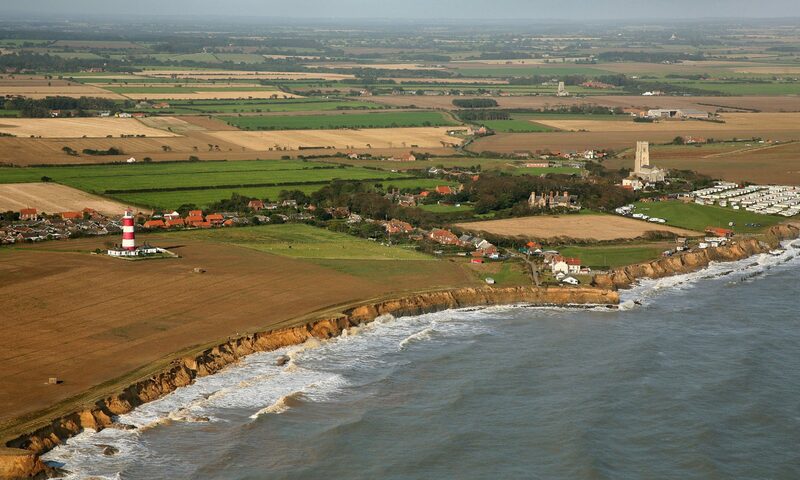 Since 2002, a neighbour of Mr England, Peter Boggis, who has been called the King Canute of East Anglia, has used more than a quarter of a million tons of clay, shingle and building site waste to shore up the cliff to prevent the houses being lost to the sea. But in 2005, Natural England designated the cliff a site of special scientific interest (SSSI), which prevented residents reinforcing it. It claimed that protecting the cliffs would prevent the study and analysis of geological exposures in the cliff and that it was necessary in the national interest that natural erosion should continue. Mr Boggis, who is a spokesman for Eastern Bavents Conservation, a residents’ group, said: “I am thankful to the inspector and the secretary of state for the clarity of their decision. Peter Scott, of Parkinson Wright, solicitors, said: “This is a ground-breaking decision; it shows that Natural England is likely to be unable through the creation of SSSIs to force people to lose their properties to coastal erosion without paying compensation. A spokesman for Natural England said it had received the inspector’s report and was considering the decision. He said the next battle would be to save Southwold harbour and the Blyth estuary just to the south. The Environment Agency decided last autumn to abandon the maintenance of sea defences there, in the same month that they repaired the sea wall outside the property owned by Tony Benn, Hilary’s father, on the Blackwater Estuary in Essex.